as part of Shakespeare 400 Chicago! Here at ChiIL Mama & ChiIL Live Shows we've been enjoying Chicago Shakespeare in the Parks for years. Pack a picnic, bring the family, and come on out for a free show. Chicago Shakespeare in the Parks launched its citywide tour at Steelworkers Park this past Sunday, following two preview performances at Navy Pier. Nearly 6,000 audience members enjoyed Shakespeare’s enchanting comedy Twelfth Night in its first weekend. 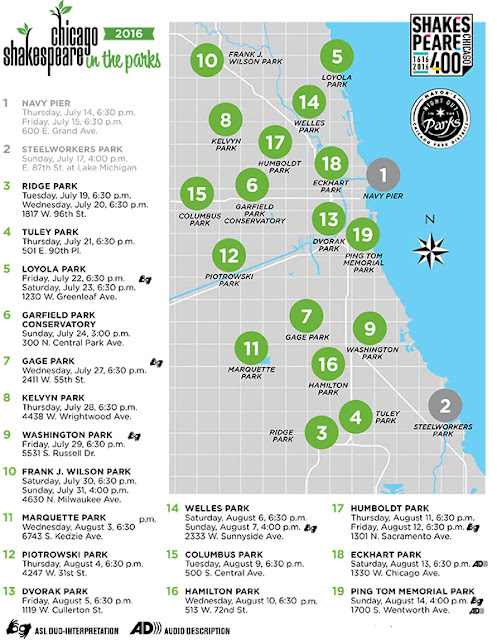 A cornerstone of Shakespeare 400 Chicago—the celebration of Shakespeare’s legacy—the FREE FOR ALL Chicago Shakespeare in the Parks tour continues to neighborhood parks across Chicago, now through August 14. 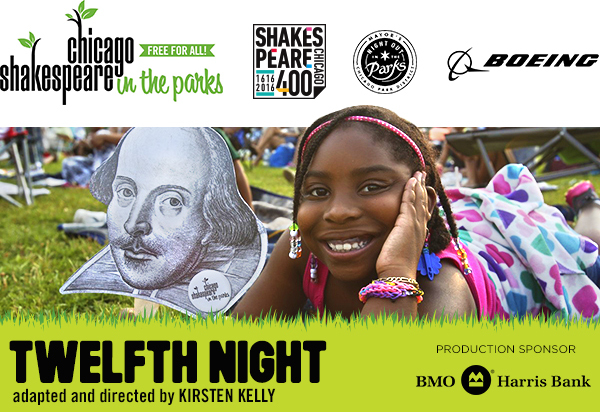 With support from Chicago Park District and Boeing, along with production sponsor BMO Harris Bank, Chicago Shakespeare Theater brings this citywide tradition to 19 neighborhood parks throughout the south, west and north sides of the city. Championed by Mayor Emanuel, Chicago Shakespeare in the Parks is the inspiration for the Chicago Park District’s Night Out in the Parks—presenting 1,300 free cultural events in Chicago neighborhood parks this summer.